Danny McBride created, directed and stars in the comedy about a televangelist family, co-starring with John Goodman. 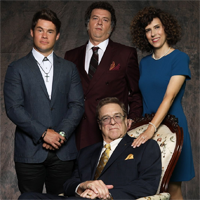 HBO describes The Righteous Gemstones as "the story of a world-famous televangelist family with a long tradition of deviance, greed, and charitable work, all in the name of the Lord Jesus Christ.” Goodman plays Eli Gemstone, the patriarch of the family, who is "unbending; a force in the Ministry game. He’s known the world over for his aggressive salvation techniques, his worldwide ministries, and his award-winning weekly television program. His light is fading, but he takes no guff. He is obeyed, unquestioned.” McBride will play Jesse Gemstone, the eldest son and “heir to the throne" of the Gemstone family, who "fancies himself a maverick in the ministry game, taking what Eli has built and expanding it for a more modern audience.” Edi Patterson will play daughter Judy Gemstone, and Adam Devine will play the youngest son Kelvin Gemstone.